Delivery options in Flurry Push vary depending on the Campaign Type you selected. Promotional push campaigns are scheduled push campaigns. Whether one-time or periodic, you tell us when to send the push. New User Retention and Event Driven campaigns are triggered push campaigns. For these, you tell us the begin and end date and time range during the day that you want pushes delivered, and we will send the push to a given user as soon as they meet the conditions specified in targeting. Users will receive the push once (if they fall within the targeting conditions) and never become re-eligible to receive the campaign a second time. ASAP campaigns are delivered shortly after you activate the campaign. Note that by setting Quiet Hours in Flurry Admin, you can prevent disturbing anyone during the night for these types of campaigns. For scheduled one-time campaigns and for daily, weekly and monthly push campaigns are delivered in the user’s time zone by default. That means everyone will receive the push at the selected time in their own time zone. If you are setting the campaign live for a time in the near future, be aware that the selected time may have passed for some users in your Targeting conditions. For example, if you are in the Eastern US time zone and schedule a campaign 2 hours in advance, users in Europe will not receive the campaign because the scheduled time is in the past for those users. To send to everyone at once, you may choose “edit time zone.” As with ASAP campaigns, you can prevent disturbing anyone during the night by setting Quiet Hours in Flurry Admin. The last option you will see is “Send to users who have already received max messages”. This overrides your maximum message caps that you may have set in Admin > Apps. For example, in Admin > Apps you may have set the maximum daily messages a user can receive to 4. (You can also set weekly or monthly). If you select this option during campaign set up, users may receive a push from this campaign even if they have already received 4 messages that day. Because New User Retention and Event Driven are triggered by user activity and behavior, the Delivery options for these campaign types are different from the Delivery options for Promotional campaigns. 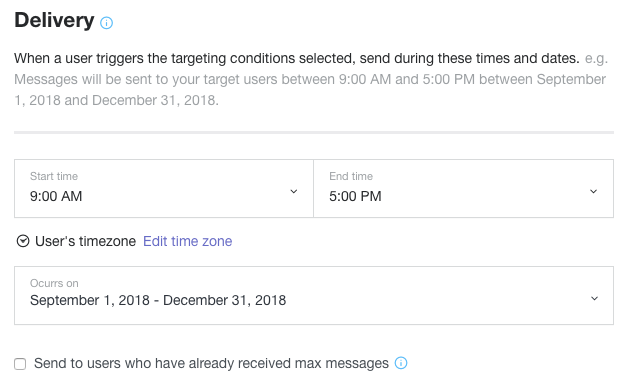 For these triggered campaign types, you select the time range during the day that you would like Flurry to look for users who meet the Targeting conditions you specified. You also select the date range that the campaign should be active. The campaign will be active between the dates you select, inclusive of the begin and end dates. As with all campaign types, by default messages will be sent according to the time range specified in the user’s time zone. You can select a specific time zone by clicking “Edit time zone.” You may also override per user message caps by selecting the “Send to users who have already received max messages” option.